I have already written of the rivalry between Adams and Jefferson for the Presidency of the USA in the year 1800, and on the autobiography of Jefferson. 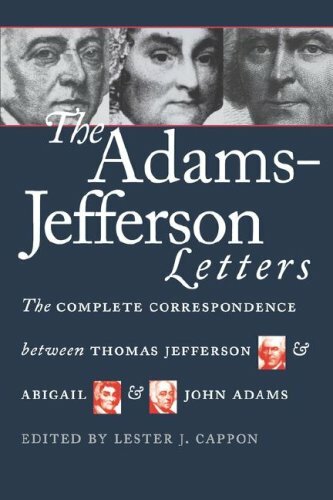 What stimulated my writing of this current article was the arrival of a book I ordered, The Adams-Jefferson Letters, which contains letters between the men, and between Abigail Adams and Jefferson, from 1777 until the deaths of the two men in 1826. I was recently reminded of these letters while viewing the HBO television series, John Adams on Swedish TV. I also subsequently ordered and viewed a videotape of the musical play 1776, which I had seen several decades ago. The play was centered on John Adams and his relentless efforts to get the Second Continental Congress to declare independence from Great Britain. I find this period in our country’s history endlessly fascinating. 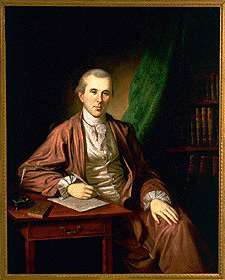 I return often to the biographies and histories of the most well-known figures and, now, some of the lesser known but no less important, such as Dr. Benjamin Rush who was the instrument through which Adams and Jefferson resumed their friendship after many years of bitter enmity, at least on the part of Adams who was the more emotional of the two men. So, I bravely wrote the first draft of this article, focusing on the implications of the frequency and of the time line the letters occupy, and forwarded it to a friend for criticism. (He, coincidentally, is currently in the process of viewing the same six-part HBO series on John Adams). His remarks are so cogent and pithy I asked to use them here, and he consented. I learned from the video that Jefferson was a bit of a libertarian radical for his time, and Adams a bit of a buttoned-down conservative. 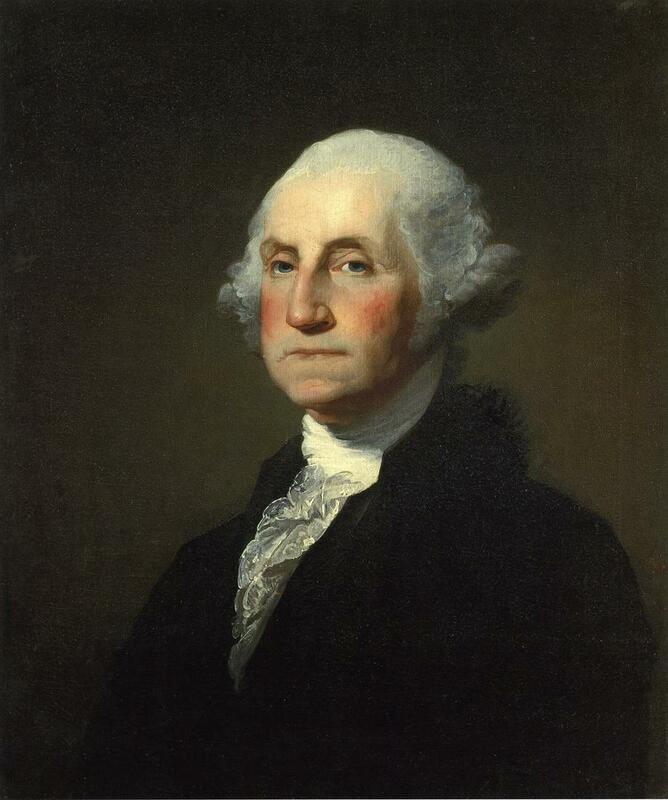 One aspect of all this is that it took the magic of George Washington’s leadership to keep them all together for the sake of the country, and that may be an…important lesson for today — that we lack a real leader like Washington. I don’t see these protagonists’ philosophical differences as akin to the political warfare we have today. In Jefferson and Adams’ day, no matter the philosophical differences, each person knew the stakes were unimaginably high. We were a small and fragile nation, always vulnerable to attack from within or without. There was no guarantee we would prevail or even survive, and the Founding Fathers faced up to this reality with courage and discipline, as well as a keen sense of reality. Today our politicians live in a Never Never Land where America is transcendent, there is no real perceived risk to us or our way of life, and debates are based on academic philosophies that have not been vetted in the real world. Today’s politicians lack the seriousness of people who know they are playing for life-and-death stakes. With my friend’s remarks as Introduction, I now offer some detail, derived from the Letters, to reveal some of the personal dynamics between these two men, without whom we would not be enjoying the liberties our independence from Great Britain afforded us, to whatever degree these liberties remain. The subcommittee met. Jefferson proposed to me to make the draft. I said, ‘I will not,’ ‘You should do it.’ ‘Oh! no.’ ‘Why will you not? You ought to do it.’ ‘I will not.’ ‘Why?’ ‘Reasons enough.’ ‘What can be your reasons?’ ‘Reason first, you are a Virginian, and a Virginian ought to appear at the head of this business. Reason second, I am obnoxious, suspected, and unpopular. You are very much otherwise. Reason third, you can write ten times better than I can.’ ‘Well,’ said Jefferson, ‘if you are decided, I will do as well as I can.’ ‘Very well. When you have drawn it up, we will have a meeting.’ (Source). From this beginning Adams and Jefferson became friends and, after the death of Jefferson’s wife Martha Wayles Jefferson in 1782, Jefferson was sometimes a guest in the home of Abigail and John Adams where Abigail and Jefferson also became friends. 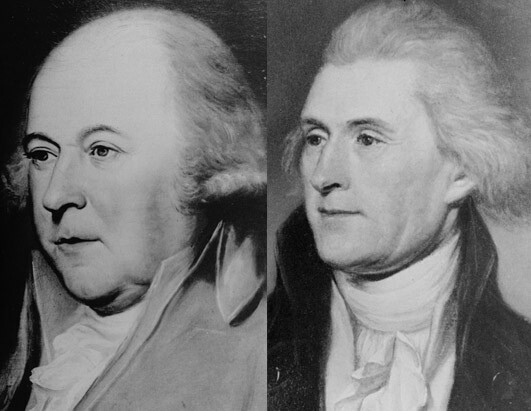 The friendships between the Adamses and Jefferson resulted in a total of 380 letters written from one to the other, between 1777 until the death of the two men on July 4, 1826, exactly 50 years after they had signed the Declaration of Independence (along with 54 others). It should be remembered that although we became independent of Great Britain by declaration in 1776, we did not have a governmental constitution until 1789. During this period the decisions of Continental Congress and then, by adoption in 1781, the Articles of Confederation, provided the framework for governance of the combined states. There were 14 presidents of the Continental Congress (two served twice) until George Washington was inaugurated as the first U.S. president, on April 30, 1789 under the new Constitution, with John Adams as his Vice President. Although there were not organized political parties until the election of 1796, there were those who called themselves Federalists and those who identified themselves as Democratic-Republicans. These groups, and later parties, had importantly differing views on the proper role of the new federal government. Simply put, the Federalists wanted more power centralized in the federal government, and the Democratic-Republicans wanted the minimum necessary accruing to the central government for the purposes laid out in the Constitution. Adams was for the Federalists and Jefferson was for the Democratic-Republicans. As they became political rivals, these differences put a cloud over their friendship which was not cleared until well after both had been out of power. 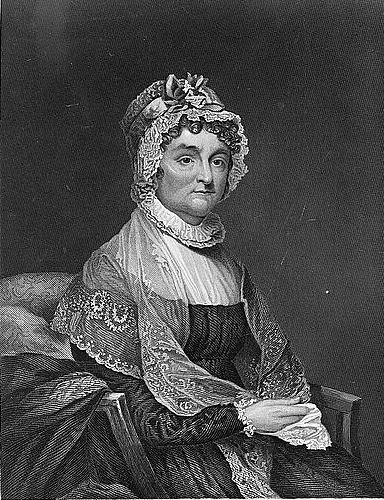 A mentioned above, the letters began in 1777, but were few in number until year 1785 when there were 69 letters between them, plus eight each between Abigail Adams and Jefferson. In the following two years there were 42 and 43 letters, respectively. In 1788 there were 12 letters. While Adams was Vice President in the eight years 1789 through 1796, after which Adams was elected President to succeed Washington, they averaged slightly over three per year between them. Because of the odd method of choosing vice presidents (since improved) Jefferson was Adams’s Vice President from 1796-1800. There were no letters between them during this period. Jefferson was elected President over Adams in 1800, and they returned to an intermittent and scanty correspondence in 1801 and 1804. Jefferson was reelected, again over Adams and others, in 1804. The two men did not correspond again for eight years until January, 1812 when Madison was elected to his second term as fourth President of the USA. One of the more bitter aspects of the retirement of John Adams from the presidency in 1800 was the fact that several of those with whom he had early co-labored during the Revolution had become his fervent adversaries. This was especially true in the case of Thomas Jefferson who, although serving closely with Adams during the Revolution, had become one of his chief enemies during President Washington’s administration. This feud not only deeply embittered Adams emotionally but it also troubled Dr. Rush, who was still a close friend of both Adams and Jefferson. In his concern over the relationship between these two, one night several months after Jefferson’s retirement from the Presidency in 1809, Dr. Rush had a dream about the two which he felt was important. On October 17, 1809, he wrote down an account of that dream and sent it to John Adams. Adams took the first step by writing a brief letter to Jefferson on New Year’s Day, 1812, the subject being a “Packett containing two Pieces of Homespun” which Adams sent under separate cover to Jefferson. Jefferson responded on January 21 and they exchanged 13 letters in this year. Year 1813 saw an explosion of pent-up expression from Adams who wrote 29 letters to Jefferson; the latter, as was his habit, wrote fewer but longer letters, only 6. Abigail and Jefferson also exchanged one letter between them this year. They continued a regular, but less frequent correspondence until their deaths in 1826. Abigail and Jefferson also exchanged, typically, one letter per year until her death in 1818. “By the summer of 1813 their accord was re-established, despite a few old wounds exposed and irritated. But their mutual friend who had brought about the rapprochement died on April 19. As Adams and Jefferson mourned Rush’s death, they took count of the surviving signers of the Declaration of Independence. Beside themselves, only six (of the 58) were alive. I think there is a lesson here for our present-day representatives, in the two branches of government where the people directly choose: there can be strong and completely opposing points of view, hard fought in public and privately, but public benefit can be maintained through disciplined argument, and through the respect such argument can engender among men of good will. I am again reminded to honor and revere the memory and the contributions of these two men, of disparate background and disposition, to our nation and to our freedom from tyranny. But, as my friend points out, strong and purposeful leadership, mindful of the endless dangers in the world, is the key ingredient in maintaining our liberties. This entry was posted in Books & Literature, Government & Politics, History and tagged Abigail Adams, Articles of Confederation, Federalists, George Washington, James Madison, John Adams, Thomas Jefferson, U.S. Constitution, United States Declaration of Independence. Bookmark the permalink. As a direct descendant of Benjamin Rush interesting to again learn of his involvement in our history. However not sure what Adams and Jefferson’s involvement of building our navy especially during pirate/Tripoli warfare against our ships. Interested to know your views on the matter. I was just quoting sources. Thanks for reading and commenting.